You've probably already seen news stories like these. More than 400 veterans of the Iraq and Afghanistan wars have turned up homeless, and the Veterans Affairs Department and aid groups say they are bracing for a new surge in homeless veterans in the years ahead. The financial strain from extended tours of duty is part of the reason for this travesty, where one in four members of the National Guard have lost their jobs while serving overseas and the government refuses to do anything about it. It's a very old tradition that repeats over and over again throughout history, where the bravest and most patriotic of the working class get screwed first. It is particularly likely to occur when a republic begins to drift towards empire. "The wild beasts that roam over Italy have every one of them a cave or lair to lurk in; but the men who fight and die for Italy enjoy the common air and light, indeed, but nothing else; houseless and homeless they wander about with their wives and children. And it is with lying lips that their imperators exhort the soldiers in their battles to defend sepulchres and shrines from the enemy; for not a man of them has an hereditary altar, not one of all these many Romans an ancestral tomb, but they fight and die to support others in wealth and luxury, and though they are styled masters of the world, they have not a single clod of earth that is their own." Tiberius Sempronius Gracchus was born in 168 B.C. to two-time consul Tiberius Gracchus Major and Cornelia Africana. 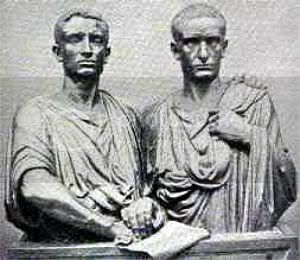 The Gracchi were a well connected and politically powerful family. They also had a long military tradition. Cornelia was the daughter of Publius Cornelius Scipio Africanus, the hero of the Second Punic War. 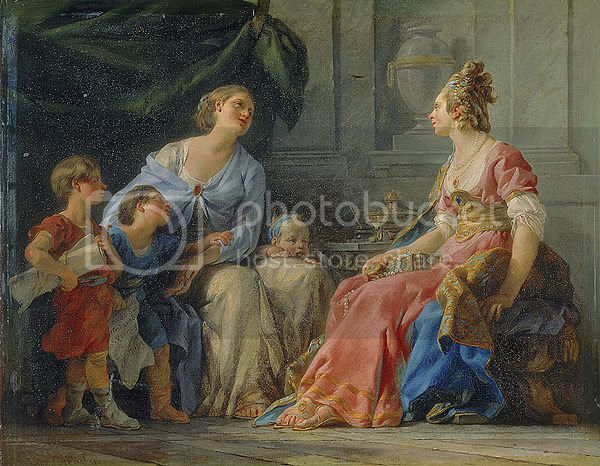 Cornelia was the one most responsible for raising their daughter Sempronia, and two sons, Tiberius and Gaius Gracchus. Tiberius was elected quaestor after he was the first man over the wall at Carthage during the Third Punic war. Years later he found himself in the Numantine War serving under the inept consul Gaius Hostilius Mancinus. After being defeated and then surrounded, Tiberius managed to negotiate a treaty that allowed the 20,000 man army to leave with their arms. Back in Rome, Senator Scipio Aemilianus, a political enemy of Tiberius, called the action cowardly and managed to get the treaty nullified. Tiberius's defining political position was the plight of homeless veterans. Before the Second Punic War, the difference in wealth between the upper and lower classes was not as great as it would be after the war. Plebeians worked for respectable wages as farmers and laborers. With the onset of Hannibal, however, everything was changed. By Roman law, legionaries were required to serve in a complete campaign, no matter how long it took. Soldiers were forced to leave their farms in the hands of their wives and children. Starting with the Punic Wars, the typical military campaign was extended from a couple seasons to a couple years. These small farms gradually went into bankruptcy and were bought up by the wealthy families, creating huge estates. Also, the successful wars brought in huge numbers of captured slaves from the conquered regions, which were used to work the plantations. When soldiers returned from the wars they no longer had a farm to return to, so they wound up being part of the teaming masses of homeless on the streets of Rome. On top of that, the enormous number of soldiers killed fighting Carthage fell disproportionately on these small farmers and working poor, as did the destruction of thousands of farms and villages by Hannibal's armies. In all, the Punic Wars caused a dramatic shift in power and wealth to the patricians and away from the plebeians. If left unaddressed, this shift would undermine the foundations of the Roman Republic. Not long after leaving military service Tiberius was elected tribune of the people in 133 B.C., and he wasted no time before agitating for agrarian reform on behalf of the homeless soldiers. The office of tribune was very powerful at the time. The holder of the office had sacrosanctity, could have anyone executed who interfered with the performance of his duties, and could veto legislation passed by the Senate. The tribune was required to have his home open to the public day or night. The tribune term of office lasted one year, and he couldn't be re-elected. The purpose of tribune was to protect the plebeians from abuses by the patricians. The fact that Tiberius held this office despite coming from a very patrician family showed just how much respect he had gained from his fellow legionaries. His brother Caius, in a certain pamphlet, has written that as Tiberius was passing through Tuscany on his way to Numantia, and observed the dearth of inhabitants in the country, and that those who tilled its soil or tended its flocks there were barbarian slaves, he then first conceived the public policy which was the cause of countless ills to the two brothers. However, the energy and ambition of Tiberius were most of all kindled by the people themselves, who posted writings on porticoes, house-walls, and monuments, calling upon him to recover for the poor the public land. In his crusade to help the homeless veterans, Tiberius reached back into ancient Roman history to a law more than two centuries old called Lex Licinia Sextia. The law was a combination of constitutional and agrarian demands. The constitutional demands had been met centuries before, but the agrarian demands had been largely ignored and unenforced. The law was intended to limit the amount of common and newly conquered lands that the patricians could own. Tiberius decided that now was the time to enforce this ancient law, which would buy out the illegally occupied land and distribute it to the poor. The plantation owners reacted to this proposal as one would expect. The men of wealth and substance, however, were led by their greed to hate the law, and by their wrath and contentiousness to hate the law-giver, and tried to dissuade the people by alleging that Tiberius was introducing a re-distribution of land for the confusion of the body politic, and was stirring up a general revolution. The ruling class convinced another tribune, Marcus Octavius, to veto Tiberius' proposal. At which point Tiberius withdrew his proposal and proposed a new one - to take the illegally occupied land without compensation. Tiberius also used an unorthodox method of proposing this law - he bypassed the Senate altogether and took the matter straight to the Concilium Plebis (the Popular Assembly), where it was extremely popular. Tradition held that news laws are proposed in the Senate first, but Tiberius knew full well that in this case that would be a waste of time. When Marcus Octavius vetoed the law, he also prevented it from being voted on in the Concilium Plebis. But Tiberius was prepared to raise the stakes. He ordered the Temple of Saturn be sealed, thus shutting down the Roman treasury. At this point Tiberius' life was now in danger. Tiberius tried to pursued Octavius to reconsider by promising to step down as tribune if he allowed the people to vote on the issue. Octavius refused to budge. Tiberius then proposed to the Concilium Plebis that Octavius be deposed for acting contrary to the wishes of the people he represented. Octavius was deposed and the agrarian law was then passed by an overwhelming margin. The Senate couldn't stop the law from being passed, but they could keep its enforcement from being funded. While the patricians spent time slandering Tiberius and trying to undermine him, Tiberius proposed new laws, including reducing the time of military service. The plebeians began guarding Tiberius' home at night in order to keep him safe from his well-funded enemies. On the day of the vote, Tiberius appeared in the Forum in mourning costume, implying that his defeat would mean his impeachment and death. The Senators had had enough. They marched on the Forum armed with clubs and spears. Tiberius' followers made a stand, but they were overwhelmed by superior numbers. Tiberius was beaten to death on the floor of the Forum. In the days that followed, hundreds of Tiberius' followers were executed in creative and brutal ways. Tiberius' brother, Gaius Gracchus was spared all this because he was serving in the army hundreds of miles away. 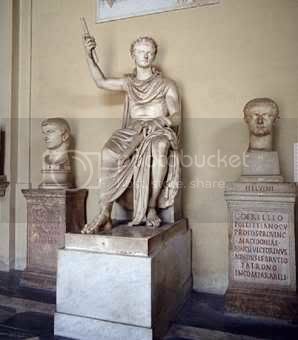 Nine years after Tiberius was slain, Gaius Gracchus was elected tribune of the people. If they suspected that Gaius would take up where his brother left off, they were wrong - Gaius' plans were even more revolutionary. Of the laws which he now proposed, with the object of gratifying the people and abridging the power of the senate, the first was concerning the public lands, which were to be divided amongst the poor citizens; another was concerning the common soldiers, that they should be clothed at the public charge, without any diminution of their pay, and that none should be obliged to serve in the army who was not full seventeen years old; another gave the same right to all the Italians in general, of voting at elections, as was enjoyed by the citizens of Rome; a fourth related to the price of corn, which was to be sold at a lower rate than formerly to the poor; and a fifth regulated the courts of justice, greatly reducing the power of the senators. In 122 B.C. Gaius illegally ran for re-election, and succeeded with overwhelming support of the people. However, when he ran for a third term as tribune he failed. The conservative government that replaced him immediately nullified many of his progressive laws. When some of Gaius' supporters resorted to murder, that was all the excuse his opponents needed. At the urging of his wife, Gaius fled Rome with his enemies in close pursuit. At some point Gaius was slain. According to Plutarch, his slave, Philocrates, stabbed him and then killed himself. This is an important essay written elegantly. Thanks so much (You wouldn't consider corssposting it, would you?). This is going in my lectures on Rome next time I teach World History. I already cite the Gracchi -- the reaction against them, and the increasingly violent nature of partisanship -- as the beginning of the end of the Republic. This is great stuff.